Hmm, could the title be longer? This post is exactly about what the title says. I started making a pair of pants from the Burda december issue and in this post will show you how I use a pattern from the magazine. A short aside: a comment was made yesterday on my post on the missing cutting layouts that Burda will bring them back in the March issue (see here (text in German), thanks Beate for sharing this information and Burda for listening to their readers!). 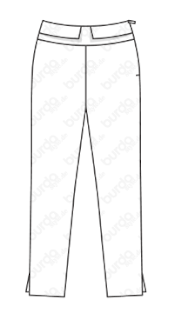 This is the pair of pants I'm making, omitting the flap in the waist. It's pattern number 102 from the December 2018 issue and available as pdf from the Burda site: Link to the pattern. Finding the pattern pieces on the pattern sheets isn't difficult. With other magazines it can be a bit difficult to find the number, but Burda has all numbers at the edge of the sheet and from there you can find the number on the pattern sheet in a straight line above or below the number on the edge. After tracing the pieces I checked the side length in the pattern information. In the picture the length looks more suitable for a pair of summer pants, rather short. This pattern has a side length of 95 cm, while a similar style pattern from February 2014 has a side length of 102 cm. 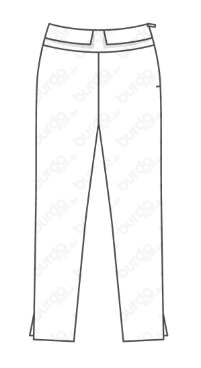 I added 6 cm to the length under the notches at knee-height (I know I don't need extra length for my legs in Burda patterns). As you might know if you have been reading my blog for a while, I'm working with seam lines, not with a default seam allowance. So I rarely add seam allowances to pattern pieces. Instead I mark the fabric with seam lines. In this way I think there's more accuracy, andI can add wider seam allowances to be on the safe side where I want to. In pants that I haven't made before I always add extra wide seam allowances in the hip/upper leg area. I use carbon tracing paper for this. First I trace beside the paper, marking notches too. Then I take off the paper, turn the piece and trace along the lines that were made. You can see my tracing paper is heavily used. My fabric has two very different sides and I had a hard time deciding which side to use as the right side. In the end I chose the lighter side. I constructed the pants with a large stitch to check the fit and hope to work on it tonight. I will make some pictures of how the slit is constructed. I follow same procedure. 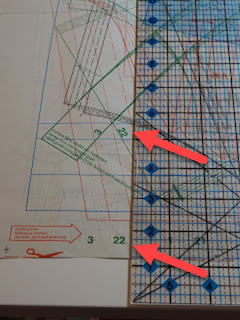 One of the reasons I like Burda is pattern shows sewing line not seam allowance for just the reason you give. Also I have to make lots of pattern adjustments, which all heve ti be done on sewing lines. I am so glad Burda is bringing back pattern layout guide.